Master Element or ME is the central point of reference for every analysis. Interactions between ME and Five Elements shows us the strength and dynamic of Character Components, Talents, and Supertalents. Barack Obama was born on a Yin Earth day; therefore Yin Earth is his Master Element. In this analysis, we will refer to it as ME. A Yin Earth ME born at the end of summer is considered to be very strong. In the summer season, the Fire and Earth elements are the strongest, while in Five Element cycle Fire is producing Earth. On top of this, the hour of birth is Yang Earth; the day is Yang Fire and Year is Yang Earth, all these elements provide strength to the Yin Earth ME. Five Elements show us dynamics within the chart. It's better to have all Five Elements present, while entirely missing or having a fragile element, which is anything below 5%, will reflect poorly on our Character Components and Talents. An excessive Element, which is anything above 40%, can also be problematic. Although Barack Obama has a lot of Fire and Earth, due to a right positioning of the elements his chart is relatively balanced. Water is fragile, but we will see how in this case the Water element is not much needed. 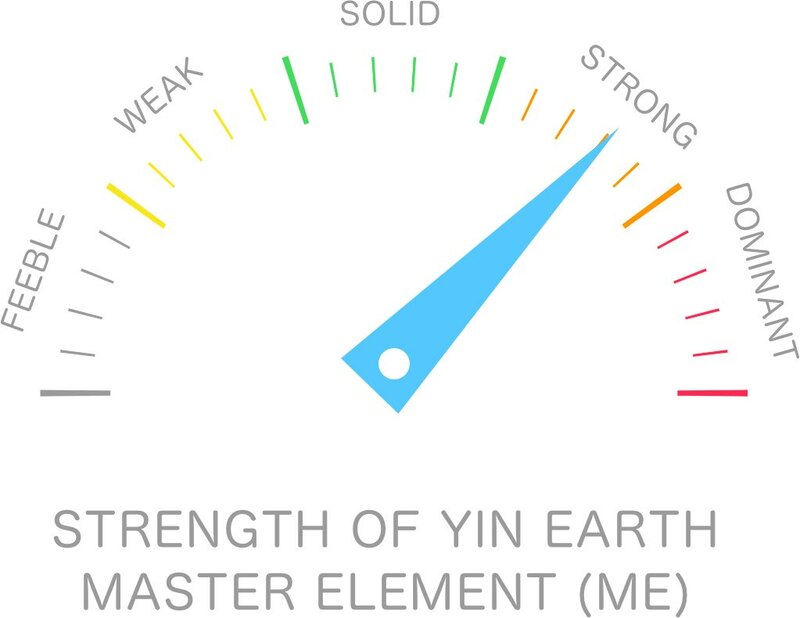 Yin Earth can store Water, and even the driest desert has some water underneath; therefore lack of Water element is often not so problematic for Yin Earth ME. Wood and Metal elements are doing a great job here in keeping the balance by challenging and exhausting excessive Earth. 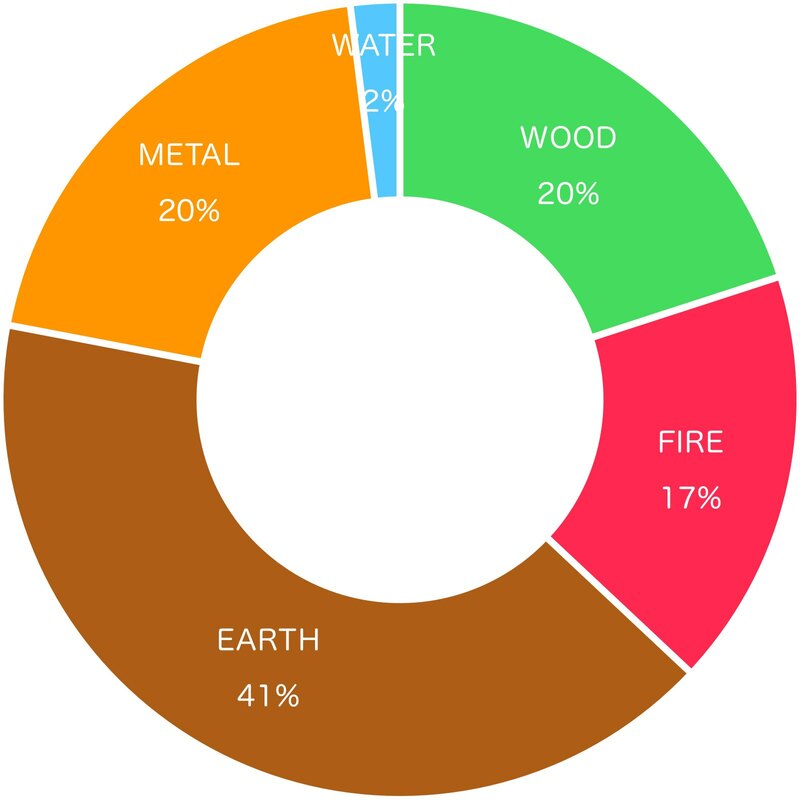 Metal and Water are cold Elements, Fire and Wood are warm Elements, while Earth usually follows the strongest one. Obama’s chart is hot, but due to proper Metal positioning, it is not so hot as, for example, Donald Trump‘s chart, who is also a Yin Earth with a lot of Fire element. Earth and Fire Elements are not needed here, but Wood, Metal, and Water will bring significant benefits. We will see in Dynamic section how this works out for him. A person’s character consists of five main Components; those are MIND, BODY, CREATIVITY, WEALTH, and POWER. We consider a prosperous chart when ME has access to WEALTH or POWER. The role of MIND and BODY is to provide support to ME and enhance other Components. CREATIVITY Component acts as a bridge, therefore in most cases is essential for chart flow. First what we can notice with Character Components is very weak WEALTH. Other four Components are active and fully functional. CREATIVITY gives Obama the ability to express himself, through speech or in written form. The most interesting Component here is POWER, which is a crucial Component for every politician. Without POWER Component it’s quite difficult to gain a high position in politics. For a politician, a WEALTH component is not so critical because they are not doing any business directly; therefore it creates no adverse effect here. WEALTH is all about hands-on management approach, while POWER Component is all about delegating tasks and motivating other people. 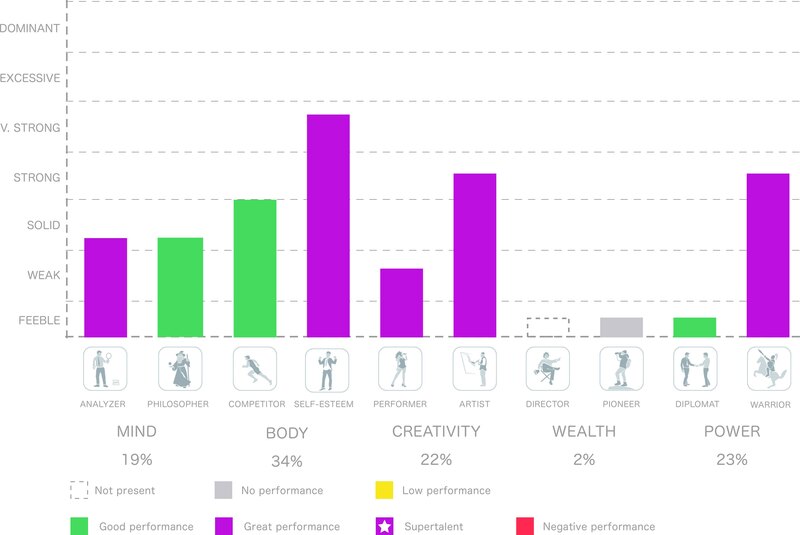 In below graph, you will find the strength of each Talent and quality of its performance. Nine out of ten Talents are present, and eight are in high performance, which is pretty good. A person with such variety of Talents can be creative in many different ways. But what is even more significant, five of his talents are performing at their highest, making it an excellent chart. The Self-Esteem is the strongest, which is quite essential for a politician, to be able to handle pressure, which comes from POWER Talents. Two MIND Talents, Analyzer and Philosopher, in combination with Artist, boost his intelligence but also gives him a strong sense of empathy, which he showed many times in his presidency. Obama enjoys a good image around the world, most people like him. He is somebody who can talk and present matter well, with a good amount of empathy. The Artist Talent brings these positive traits to him and is essential to his personality. The Dynamic between MIND, BODY and CREATIVITY Talents is superb. On top of it comes his strong Warrior Talent, which represents political power. By default his POWER Talents are solid, but in the Dynamic chart, we will see how they become even better. Obama has an excellent mix of talents, able to do many things, from leading teams, rallying people, public speaking, writing, etc., so even after his presidency, he will have many options to bring his messages across and inspire people. The strength of each Talent is not the only factor in determining its impact. To understand their functionality entirely, we have to see whether they cooperate or disturb other Talents. Cooperations between Talents are vital for having a good chart flow. Even the weakest Talent can have a crucial impact if appropriately positioned or combined positively. 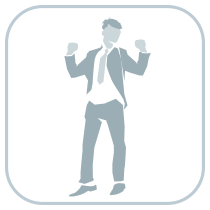 The Self-esteem is the strongest in his chart, and it has a crucial role in obtaining Power and Creativity Talents. It is a primary driving force in his Chart which ignites everything else. The Competitor is substantial, working together with Self-Esteem to obtain various Talents. The Philosopher is providing substantial support to ME. The Analyser plays various roles, but the most important is a direct combination with The Artist. This combination represents intelligence. The Performer is stable and works along with Artist, boosting already strong Creativity even further. The Artist plays a significant role, and ME has direct access to it. 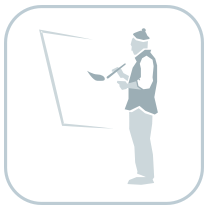 Artist is involved in various work, boosting intelligence, creativity, and positive image. The Director is not present in his chart. The Pioneer is present but weak, therefore doesn’t perform much work. It doesn’t disturb the flow of other Talents, which is important. The Diplomat combines directly with ME, therefore extremely useful for obtaining Power. The Warrior is the central point of his chart, most of his political power comes from it. It’s the end goal of the entire chart, and the whole system works pretty much flawlessly, making his Warrior exceptionally useful and able to perform. Every ten years each person is influenced by an additional set of elements, bringing dynamic to the static chart, therefore causing people’s destiny to go up and down all the time. Obama’s static chart on its own is already highly functional, but usually, to reach such position as president of US, the help from the dynamic chart is needed. For Yin Earth person the element of Wood represents Power or political career in this case. At the year 1999, he entered an active period of Wood element, which will last for 20 years. Considering that his Earth element is the strongest in his chart, additional Wood is welcome because it gives Earth something to do, putting the entire chart into motion. Together with Wood, he got an additional Metal Element, which improved his creativity, image, and ability to express himself, creating a perfect balance. Water Element is still missing here, but the whole setup showed us that this Element is not needed. Overall dynamic of Talents is quite exceptional in Obama’s case. There are special connections all over the place, boosting his intelligence, creativity, and power. It’s hard to say which one is more important. Self-Esteem and Philosopher support Yin Earth ME, which has direct access to Diplomat, and indirect, but powerful access to Warrior Talent. Obama has a compelling chart, and it is not surprising that he became the most powerful person in the world, with such variety of Talents, all playing nicely together. There is one small drawback though. For each Talent, we can measure how far its influence can go. So for example, his Artist Talent has a global impact, it means that reach of this Talent is worldwide. But his Warrior and Diplomat Talents, which belong to POWER Component, have only national range, which means just in the US. In reality, this reflected that his international policy wasn’t that successful as in his own country. Although he tried to negotiate in many world crisis, his plans failed, especially in the middle east where ISIS rose up during his presidency and became a huge threat, and not just for the region, but for the whole world. So due to his far-reaching Artist Talent, his image was quite influential among world leaders, but the effectiveness of his international policies are questionable. Another interesting detail, his Earth element does significant work in obtaining Wood, which is political power to him. Earth usually represents underground work, which means that Obama has stored a substantial political power during his presidency, which he will be able to use even after his two terms as president of US. At the moment of our birth, roughly 30.000 people around the globe will receive exact element combination as we did. So the logical question is, how come that these famous people from our examples are so successful, the others are not? If somebody is born, for example, with a superb chart for generating wealth, their level of success will depend a lot on their place of birth. Mark Zuckerberg, Steve Jobs, and Bill Gates, for example, were born in surrounding with a lot of opportunities and culture for creating large businesses. Somebody with the same chart, but born in the poor area, will have far fewer opportunities to exercise their ability to generate wealth. Still, it's very likely that they will reach a reasonable level of success, but their surrounding will limit it. Place of birth is not the only thing making a difference, our parents genetic, community culture, parents upbringing and formal education will shape significantly our ability to use given talents. Despite all these conditions, the core of our talents will always be there, and it's just a question how far they can be extended. 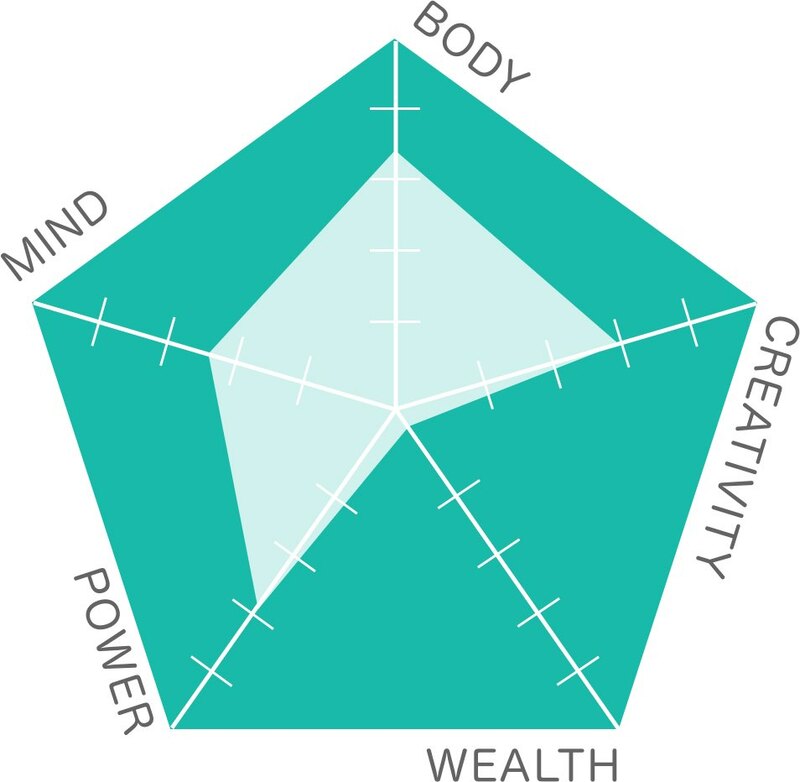 So regardless of our chart, hard work, life experience, open-mindedness and a good education is still very important to unlock our full potential.